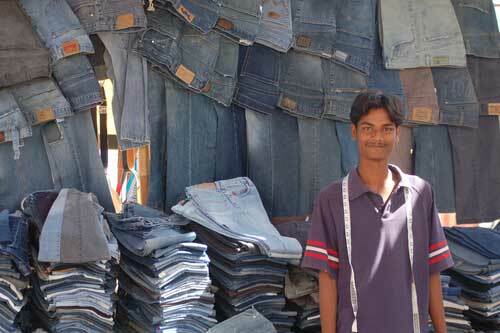 The normal fate of a pair of jeans is to be worn out. Never mind the different definitions of "worn out" on either side of the generation gap. In between wearings, however, they must be stored, and again the generation gap inserts itself. Like I did at his age, my son prefers the crumpled pile method. Nowadays I opt for folded. I'll admit it; I did try hanging, but later discovered that Mommie Dearest was right - "no metal hangers, ever!" Vertical creases go in and out of style, but horizontal creases? Definitely a fashion faux pas. There is undoubtedly some interesting chemistry behind why cotton is more susceptible to being creased than some other fabrics, but the big news this week is that the long-sought secret code to packing long DNA molecules into compact chromosomes has started to unravel. Since our DNA also contains the codes for our numerous inherited genes, you could say that this new, embedded code may reveal nature's preferred method for folding genes. During cell division, and when the gene codes are being read, or "transcribed", in order to synthesize proteins following natural just-in-time operations, our chromosomes must quickly unfold and unravel back to the stringy double-helix that has become iconic. After taking care of business, the 23 pairs of double-stranded DNA molecules, which would range a few meters in length if completely straightened out, and contain thousands of genes each, must just as quickly ravel and fold back into the familiar butterfly shapes that can be seen under the microscope. Properly folded, they all fit in a drawer (our cell nucleus) that is measured in millionths of a meter. My mother recently sent me the link to the "How to fold a shirt" movie clip. I couldn't understand a word of the folder's explanation, but I was impressed by the simplicity of the method. Just one fold, a couple of shakes, and voilà - a perfectly folded shirt! We do a far more impressive folding job with our genes, but scientists aren't completely sure how we manage to do it. We have known for decades now that metals are needed to begin the process. In particular, positively-charged metal ions both balance the electric charge on a DNA molecule in cell conditions, and act as a sort of template for coiling the double-helix in the first phase of gene folding. Metal ions are much too small to assist in the next folding phase, which involves wrapping the thickened coil around tiny spools to form evenly-spaced beads called nucleosomes. You can think of a very long pearl necklace (unfastened) where the valuable part is not the pearl, but the string. And the string doesn't go through holes in the pearls, but is wrapped around neat stacks of eight pearls each - 1.65 times, or 147 units of genetic code, with only slight variation. Each of our cells contains millions of such spool assemblies, which are themselves called histones. Despite their rocky name, and the analogy to pearls, histones are not mineral, but made of protein, and have been studied in atomic detail. DNA doesn't just wrap around histones in a repetitive manner - the looseness of the fit also responds in a highly predictable way to changes in the chemical environment. Harvard chemist Stuart Schreiber is among those at the forefront of what has been called epigenetics. Such research is unraveling the changes in molecular structure, to either DNA or the histone surface, which cause DNA to unravel completely, or just enough to enable some essential biochemical process to occur. One of the key chemical changes is acetylation. This is the same minor chemical modification that Bayer chemist Felix Hoffman made to willow bark extract over 100 years ago. Students routinely redo this experiment in freshman chemistry labs when they make aspirin on their own. Various diseases, and embryo development failures, are thought to be caused by erroneous folding or unfolding of DNA. So this research is not just an elaborate Sudoku puzzle - done just for fun. The atomic understanding of histone structures in various organisms, as well as accumulated knowledge of the effect of site-directed chemical modifications, has led to clues about what causes DNA to fold and unfold at the proper place and time. In particular, research by large teams of molecular biologists and biochemists, undoubtedly wearing out numerous hard-working grad students, has led to the supposition that our DNA has a so-called "histone code" embedded along with its genetic code. Scientists figured that there was no other way to explain the high geometric regularity, and the repeating patterns of chemically regulating the attachment of genetic material to histones. As you may have read in the New York Times this week, a team of scientists - led by a computational biologist in Israel and a biochemist at Northwestern University - claim in Nature that they have deciphered an important part of the histone code. Time will tell if this discovery holds up to the light of skeptical challenges in laboratories around the world. One thing is sure though, unlike the Dan Brown blockbuster, this unfolding story is non-fiction.